People often ask Ernie Tremblay about how he got into the business of evaluating drugs and medical therapies… and why he goes to such lengths to uncover opportunities with enormous investment potential. The story starts back on June 23, 1981 when Ernie received devastating news from his doctor. He was suffering from a rare – and sometimes fatal – disease called Guillaine Barre Syndrome (GBS). Now Ernie was one of the lucky ones. Even though there were no effective drugs available to treat GBS because it was so rare, he survived. That brush with a serious illness… along with losing multiple family members and loved ones… inspired Ernie to dedicate himself to evaluating new drugs that relieve suffering. After 25 years of being immersed in the medical science field, Ernie understands the FDA approval process, the hard science behind new drugs, and the market demand for new treatments like no one else. His powerful three-phase formula can accurately determine whether a new drug will be a breakthrough winner – or a casualty of an FDA denial. And once a drug has passed Ernie’s rigorous evaluation, it typically translates into big gains… like the 621% his readers had the chance to score in less than 12 months on Aegerion Pharmaceuticals … or the 304% they could have seen in just nine months on Sangamo Biosciences. As anyone who’s tried to predict the movement on a drug stock knows, timing is everything. Move too early and it could be years before the stock moves. Wait too long and you’ll certainly miss out on the big money. And with only 1 out of every 5,000 drugs in development making it all the way through the FDA approval process, Biotech Insider Alert members trust Ernie to get the timing right as he guides them to coming breakthroughs. It began with a surprise announcement from the FDA that threw the doors wide open for dozens of tiny “first-mover” biotech companies working on new cannabis-based treatments for everything from chronic pain to Alzheimer’s. It’s an amazing story – and an exciting ground-floor opportunity in the $70 billion pain medication market could turn a small stake into over $200,000. Now that this new industry has the government’s full blessing, things are moving very fast. Investing in biotech and pharmaceutical innovation holds a special kind of satisfaction. Not only do you get to be a part of finding the cure for devastating diseases and helping people live longer, more enjoyable lives, but you’re tapped into the most explosive profits on Earth. Breaking news can send a biotech stock blasting higher in days, sometimes overnight. Big-name biotech investors get this. Folks like Patrick Shiong Soon, who sits at number 145 on the Forbes Billionaires List, or Randal Kirk, who recently made $1.5 billion off a single biotech company – nearly $700 million of it in a single day. But it can be just as life-changing for individual investors. There’s no shortage of opportunity, either, with 1,300 companies in the U.S. alone forging new ground in drug discovery and technology, and hundreds of drugs in the approval pipeline right now. The trick is knowing which ones deserve your investment dollars. Just because a company develops a new drug… doesn’t mean the drug will work. In fact, chances are, it won’t. Out of every 5,000 new drugs, the FDA will ultimately approve only one. That’s why Ernie Tremblay’s Biotech Insider Alert has gotten so much attention in the last couple of years. In fact, Ernie was recently singled out as the “most winning” stock picker in 2014. Not just in biotech, but in the entire investment newsletter industry. At the time of the announcement, about 60 stocks had returned gains of 100% or better during 2014. Four of those 60 stocks were Ernie’s picks. Now, 2014 wasn’t a particularly good year for the biotech sector. But with expertise like this, market conditions don’t matter. Ernie is actually a researcher/writer who spent decades immersed in the medical science field. That’s how he has come to understand the FDA approval process better than almost anyone. He distilled everything he learned into a powerful three-phase formula to determine whether a new drug will be a breakthrough winner – or just another casualty of an FDA denial. Please note: Ernie has made his formula public. But he cautions investors not to try to use it on their own without guidance. It’s only effective with the overlay of his experience, contacts, and rigorous due diligence – as well as investment expertise and a strict risk management discipline. Clearly, getting that timing right is key. It can mean the difference between a nice 50% return… and a gain that’s absolutely life-changing. So Ernie developed a calendar to track the upcoming dates, to take the guesswork out of wondering when (and if) those gains will come. Here’s an example – one that made his readers a ton of money. In late 2012, Ernie was tracking a meeting scheduled for October – something called an Advisory Committee (AdCom) meeting – where medical experts get together and make an unofficial recommendation as to the drug’s effectiveness and safety. They were looking at a new drug, lomitapide, that wasn’t getting a lot of media attention. But Ernie knew about it because, a few years back, he had interviewed the drug’s lead researcher – a University of Pennsylvania MD named Dan Rader. They were developing it to treat HoFH, a rare, hereditary cholesterol problem that causes premature death and terribly disfigures people afflicted with it… especially kids. It was Dr. Rader who “rescued” lomitapide from a Bristol Meyers project that was abandoned in the 1990s because it caused stomach problems in early test patients. But he and his development team figured out a way to eliminate the gastrointestinal problems, and started testing it in new clinical studies. The results were fantastic. Cholesterol levels dropped substantially with no unmanageable side effects. Patients were living longer. 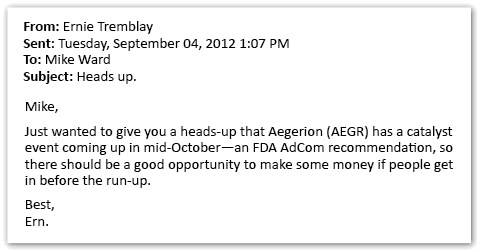 Having seen the data and researched the findings, Ernie knew chances were very good the AdCom panel would vote in favor of passing the drug – which would be huge for the small biotech called Aegerion (AEGR) developing it. Within weeks, lomitapide received a very favorable AdCom recommendation, just as Ernie said it would. It rocketed from right around $17 a share – up to and past his target price of $72… all the way to a 52-week high of $101 a share. Ernie’s readers took profits four times, finally scaling out of the position. In the end, they made 103.38%… 248.00%… 307.22%… and 345.42%. Now, some folks would have hung on for more gains. But based on his experience and discipline, Ernie advised them to “cash out” in October 2013. Good thing, too. After the excitement wore off, the stock started to retreat and fell all the way back down to $20/share. That’s part of what makes Biotech Insider Alert so powerful. WEEKLY RECOMMENDATIONS FROM A TRUE "INSIDER"
Every week, Ernie guides his readers through the intricate niche world of biotech. The odd vocabulary… the science… the approval process… ongoing analysis of the drug’s potential – and how a success could impact a stock. He gives specific advice on when to buy, how to protect yourself, and perhaps most importantly, when to take profits. All before most investors even know these opportunities exist. This kind of ongoing guidance helps members get the most out of these trades, while minimizing the risk. In just over one month we’ve already made $2,925. We are grateful for you and your amazing work at translating the confounding world of biotech. It also helps deal with the unexpected. Sometimes, as with AEGR, these calendar catalysts come the exact day Ernie predicts. Once in a while, they get delayed. The FDA is a government agency, after all, and trials sometimes need more time to test or verify results. At that point, Ernie steps in with new instructions. You need to know what to do. Sometimes, too, they even come early. Like with Aerie Pharmaceuticals (AERI). Ernie slapped a “buy” on AERI at $15.67 on May 30, 2014, in anticipation of a calendar date on June 30th – a release date for Phase 2b trial results for an experimental glaucoma drug. But the announcement came four days early, and it was hugely positive. The stock popped to $26.98. Members who followed his instructions were thrilled. A profit of $5,440, a gain of 67.36%. Not a bad result for 26 days! And I never would have made this kind of investment without your service. Ernie monitors the portfolio constantly and keeps in touch. He’s averaged 10 alerts per month to his Biotech Insider readers. That’s better than two per week. And he’s been known to send as many as 15 alerts in a given month, when they’re needed. It’s all in pursuit of profits. Ernie only recommends biotech and pharmaceutical stocks, typically in the small- and mid-cap range. A market cap of $250 million to $2.5 billion is what he calls the “sweet spot” for growth. This strict focus culls out a lot of possible investments. And it provides three big advantages. One, lower market-cap stocks are more responsive to catalysts, like FDA approval or a positive trial outcome, so they can really see a pop in share price. Two, little players like this have “buyout” potential – another way to make easy overnight gains. Three, there’s sufficient liquidity, so you can get in and out when you want. His trading strategy is as simple as it gets. You buy and hold. When it’s time to take profits, you sell. There’s no options or shorting or complicated trades. In fact, Ernie flatly refuses to recommend options trades on biotech stocks. It’s too risky. And you don’t need to leverage up to make huge gains. Not in the fast-paced biotech sector. Like anything where the potential reward is this extraordinary, there is some risk involved. So with every recommendation he gives, Ernie also explains what kind of stop-loss mechanism you should have in place. He’ll specify a recommended portion of your capital to apply to the position, or he’ll ease you into a position with a split entry. It’s already paid off for his members. The biggest financial opportunity in decades is unfolding right now. • And potentially save hundreds of thousands of lives in the process. Meanwhile, early investors in this new industry are positioning themselves for the millionaire-making potential. In fact, early research suggests a small stake in just a few of the “first-mover” companies in this new industry could return as much as $2.33 million. And it all starts now – with the full blessing and support of the U.S. Government. You DO NOT want to miss out this time. Biotech Insider Alert analyzes upcoming FDA actions to discover which ones will drive a company’s stock to new heights long before the mainstream financial press notices. He also consults with highly respected medical and scientific experts to separate the ground-breaking discoveries from the “me too” drugs and medical devices. Every recommendation must meet three critical tests: The science must work. The market must be hungry. Timing is everything. This strategy pinpoints medical discoveries that the market is waiting for. 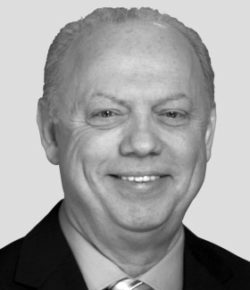 Biotech Insider Alert uses Ernie’s over 20 years’ experience studying and writing about the latest developments in health, medicine, and related technologies. He understands the FDA approval process, the “hard science” behind these drugs, and the market demand for them, better than almost anyone else on earth. You can subscribe to the Biotech Insider Alert here. The Biotech Insider Alert portfolio is driven by Ernie’s “Secret Calendar” – a tool he developed to track the most important catalysts for biotech, pharmaceutical, and medical device stocks. There are over 140 “calendar dates” scheduled for drugs and devices already in 2015 – with more being added all the time. The trick is knowing which ones will be big winners and which ones will fall flat on their faces. Since the launch Biotech Insider Alert readers have scored a 71% win rate, with 10 double-digit gains. Each week, Biotech Insider Alert readers receive a full update on every position in the portfolio along with special updates on how FDA actions are impacting your investments. Since launching, Biotech Insider Alert readers have scored a 71% win rate, with 10 double-digit gains. Go here for immediate access to Biotech Insider Alert portfolio updates. You must be logged in to view exclusive Biotech Insider Alert investor briefings. The Biotech Insider Alert library includes Ernie Tremblay’s in-depth research reports that not only provide comprehensive analysis, but an explanation of key biotech terms and concepts. You’ll also find Ernie’s proprietary Three-Phase Formula that drives his success. Go here for immediate access to Biotech Insider Alert investor briefings. To give Biotech Insider Alert Members the most in-depth and up-to-date information on promising biotech companies, Ernie will arrange and record members-only conference calls. Access the recordings to hear Ernie cover the latest on current Portfolio recommendations, discuss upcoming Catalyst dates, and answer questions from Members.